Status: Uncommon regular resident west, locally uncommon southwest, rare elsewhere. Rare casual winter visitor statewide away from breeding locations. Documentation: Specimen: UNSM ZM10305, 14 Jul 1910 Sioux Co.
Taxonomy: North American birds, formerly known as Pica pica hudsonia, were recently afforded specific status, separate from those of Europe (Banks et al 2000). No subspecies are recognized (Gill and Donsker 2017). Changes Since 2000: The range of Black-billed Magpie in Nebraska has diminished westward to a significant extent, and distribution has become increasingly fragmented, with many breeding locations isolated from others and in danger of extirpation. Overall numbers have declined significantly in the last decades, especially from 2003-2013 according to BBS and CBC data (see below, Appendix). The decline in numbers and reduction in range has occurred since the arrival of West Nile Virus and that disease is believed to be the source of the declines (see Comments). The current (2019) range map shown above was revised from the original that was created at the end of 2017, a topic discussed on this blog post. Resident: Jorgensen (2016) reviewed the status of this species in Nebraska. Prior to 1900 Black-billed Magpie bred virtually statewide, including Cuming, Cass, and Gage Cos (Bruner et al 1904). After 1900 the range contracted and by mid-20th Century breeding was confined to the west and northwest, where it was still a common breeder (Rapp et al 1958). Since the 1950s, numbers have fluctuated markedly, especially beginning around 2004, when numbers declined significantly for a few years. BBS Trend Analysis 1966-2015 shows an annual decline of 9.43% (95% C.I. ; -11.47, -7.32) and for 2005-2015 an annual decline of 8.96% (95% C.I. ; -14.45, -3.57) (Sauer et al 2017). 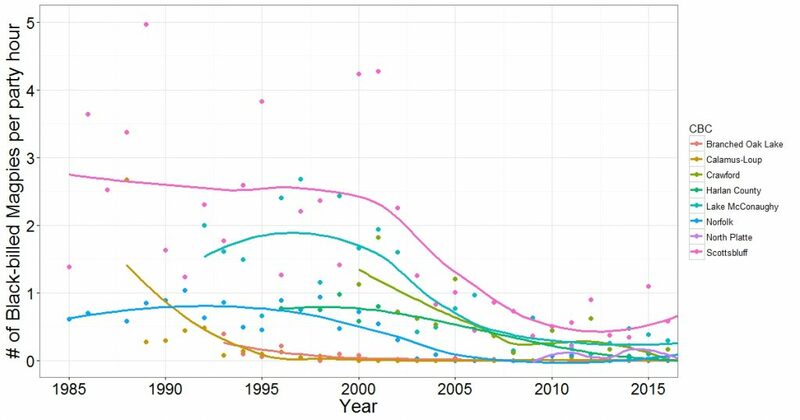 Mollhoff (2016) found a “precipitous decline” in the percentage of BBA blocks reporting this species from 34% during 1984-89 to 8% in 2006-2011. CBC data suggest severe overall declines at certain locations. The Harlan County Reservoir CBC, Harlan Co 21 Dec 2014 found none, compared with three the previous year and an average of 24 per year 1996-2001. The North Platte CBC had five in 2014-2015, the best count for 2008-2015, but insignificant compared to the count’s record of 194 in 1938. On the Norfolk CBC in Madison Co, as many as 222 were counted 1985-1989. During winter 2013-2014, only 32 in all were reported on CBCs, all in the west: 16 at Lake McConaughy 29 Dec, 10 at Scottsbluff 15 Dec, five at Crawford 21 Dec, and one at Harrison 22 Dec. The Pine Ridge remains a stronghold, along with Scotts Bluff and South and North Platte River valleys in Keith Cos; a flock of 32 was at Fort Robinson SRA, Dawes Co 2 Oct 2015, and there were “lots at various places” in Sioux Co 22-23 Jun 2015. The Scottsbluff CBC 18 Dec 2014 counted 24, and there were 11 additional reports 2014-2016 from Scotts Bluff Co of 1-6 birds. A colony of six nests with eggs was seven miles southwest of Redington, Morrill Co on the Bighorn Escarpment 11 May 2002 (Mollhoff 2004). A family group of eight was in Snell Canyon, Lincoln Co 8 Jul 2014 and seen again 21 Nov, although none were found in the cedar canyons in Lincoln Co on 453 count points in 2013. In 2011, three groups of 9-15 were in Custer Co 20 Apr, and one was at Pressey WMA, Custer Co 30 Dec 2016; it was noted in 2015 that “it seems like more get reported from [the area around the Gibbon I-80 exit] than any other spot in the eastern two-thirds of the state”. Since about 2000, numbers in the northeast have been sporadic and scattered at best, and numbers are rapidly declining. Most reports have been from two general areas: the Crofton area of Cedar Co, and Madison Co, and counties adjacent to these two areas. In Cedar Co, there have been 11 reports since 2010, including four on 7-18 Mar 2014, but none have been reported there since 17 Dec 2017. In adjacent Knox Co, there are only three reports since 2005: Jul 2005, 9 Sep 2011, and 26 Feb 2017, and in Dixon Co one was reported in 2010 and three were found 7 Apr 2018. A population in Madison Co is persisting in low numbers; five were seen west of Norfolk in the area of 550-553 Ave and 826-844 Rd 8 Sep 2014 where none had been seen for 5-6 years, eight were there 2 Sep 2017, one on 16 Dec 2017, and, most recently, two on 27 Jan 2019 (DH, SB). In adjacent Pierce Co, a nest was found in 2018 and a single bird was seen near Willow Creek SRA 20 Jan 2019 (David Heidt, pers. comm.). There are sporadic reports since 2010 from counties adjacent to Madison and Pierce, including Antelope, Thurston, Cuming, and Stanton; of the the five reports, most recent is from Thurston Co 19 May 2014. There are no current (2018) breeding locations in eastern Nebraska except for Madison Co. The most recent records from Dodge Co south were of a nest with five eggs 28 May 2002 in Dodge Co; a nest was found there in 2004 and another in 2005 that was later abandoned. Nesting occurred in Seward Co in 2007. Breeding has occurred in Lancaster Co, but there have been no reports since 1987. The species may still be persisting in northwestern Jefferson Co, where one was present 24 Jun 2017 (Matt Hansen, personal communication). A photographic documentation through the nesting season of a nest in Hall County in 2004 was made by Ron and Anne Kruse (Mollhoff 2013). High counts: 107 in Scotts Bluff Co 23 Aug 1996, 65 at Lake Ogallala, Keith Co on 2 Sep 1993, and 50+ near Gibbon, Buffalo Co 31 Aug 2000, all apparently post-breeding flocks. Winter: This species is not migratory, but occasionally exhibits post-breeding dispersal to areas where it does not breed. Blake and Ducey (1991) noted that “occasional wanderers” appeared in Holt Co in fall; near Gilead, Thayer Co, an observer stated in 2014: “I’ve seen several pairs there over the last four years, usually over the winter”. At locations on the east edge of the breeding range, post-breeding dispersal occurs in Sep and later. In Lancaster Co 1-2 were reported on Lincoln CBCs up to 1998. Scattered additional easterly reports during the non-breeding season are 13 Mar 2017 Seward Co, 18 Sep 1981 Greenwood, Lancaster Co (Williams 1982), Washington Co 25 Oct 1998 “the first modern record”, 2 Oct 2001 Washington Co, 3 Dec 1998 three miles north of Bennington, Douglas Co, 15 Feb 2013 Saunders Co, and 14 Mar 1987 Douglas-Sarpy Cos.
High counts: 250 in Lincoln Co 14 Jan 1934 (Tout 1947) and 50+ in Scotts Bluff Co 3 Dec 2012. Comments: The pattern and cause of recent declines has been discussed by various individuals. Mollhoff (in Silcock 2013) believed that in most of the state, the species now occurs only in pockets, possibly comprised of family groups, that are susceptible to local extirpation, a conclusion supported by Jorgensen (2016). The definitive cause of the decline in most areas of the state is less clear and may involve various factors. West Nile Virus is the most likely explanation, and may be the sole cause, since recent declines correspond with its arrival in Nebraska and on the Great Plains. Jorgensen (2016) presented data from the Centers for Disease Control that showed the highest rates of West Nile Virus incidence in humans corresponded to the approximate areas where Black-billed Magpies have experienced the greatest declines. Differential West Nile Virus incidence in humans, which may also affect magpies, was attributed to weather and climate cycles that influence the abundance of Culex mosquitoes, an important disease vector, in the Great Plains (Jorgensen 2016). However, other variables may also be affecting magpie populations. Trost (1999) cited studies suggesting that Black-billed Magpie is adapted to “cold, shrub-steppe environment” and distribution might be limited by climatic factors such as temperature and humidity” … “rather than by food availability”. Recent warm years may thus be playing a role in the fragmentation of the Nebraska distribution. Figure 1. Number of Black-billed Magpies recorded per party hour on selected CBCs during the period 1985-2017. Black-billed Magpie abundance was variable throughout the entire period, but fewer Black-billed Magpies were recorded on all CBCs after 2000 and declined in following years. Jorgensen, J.G. 2016. Status review of the Black-billed Magpie (Pica hudsonia) in Nebraska. Nongame Bird Program of the Nebraska Game and Parks Commission, Lincoln, Nebraska. Mollhoff, W.J. 2013. Photo documentation by Ron and Anne Kruse of Black-billed Magpie nest in Hall County. NBR 81: 81-86.